Nishida Jun, spirited conceptual ceramic artist and inspiration to many aspiring potters, has passed away at the young age of 28, March 27th, 2005. Jun-san was killed during the building of an electric kiln for the people of Bali. The preservation of Bali's indigenous pottery tradition was his dream and life work, and Jun-san strongly believed that technological advancements/assistance could help the islanders nurture and retain their pottery traditions as an effective industry. 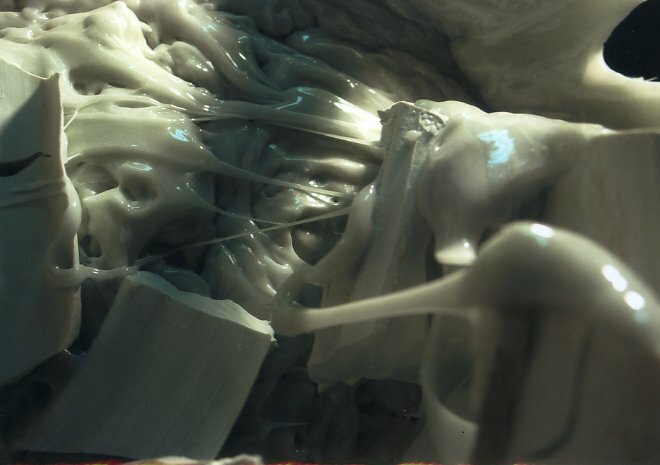 He will be remembered for his brilliantly massive porcelain art, especially his Zetsu series, which both expanded and transcended the boundaries between glaze and clay. His works were innovations in glazing, forming, and firing, and continues to inspire fans around the world. Jun-san's sudden and tragic death has deeply saddened all those who have been touched by his life and his art. He will be missed but not forgotten, as we must console ourselves with the thought that Jun-san's life was lost during the pursuit of his life's passion, and with the reassurance that his life, embodied in his art, will continue to touch the hearts of many. Conceptual Gravity. Nishida Jun's titanic portion of fired clay and glaze lies immobile upon a wheeled cart in a cluttered corner alleyway of Kyoto's Seika University, his alma mater. 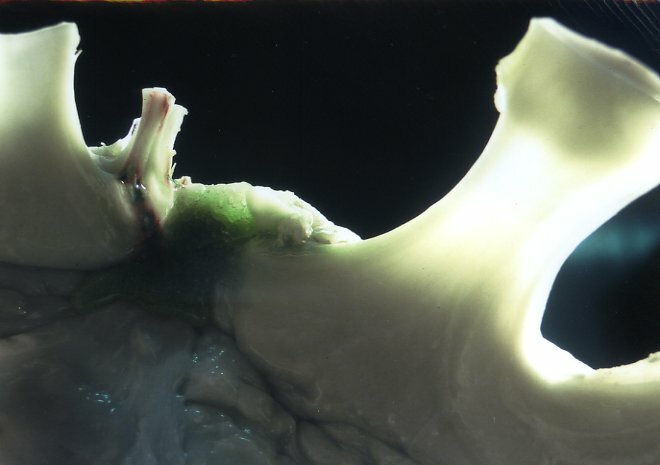 Porcelain pipes protrude from the white mass, but are splintered, and not by chance. It is a devastating, brutal, display of raw power, along with a thrilling eye for detail. "Oh, this one didn't turn out so well," said Nishida, apologetically. Alas. It was but garbage. But what captivating garbage indeed! Fractions of porcelain vessels, made either on the wheel or through slip-casting, are smothered and encased in cakes of snowy glaze. It looks as if a massive dinosaur egg had been pillaged by the neighborhood raptor on the prowl for young protein. 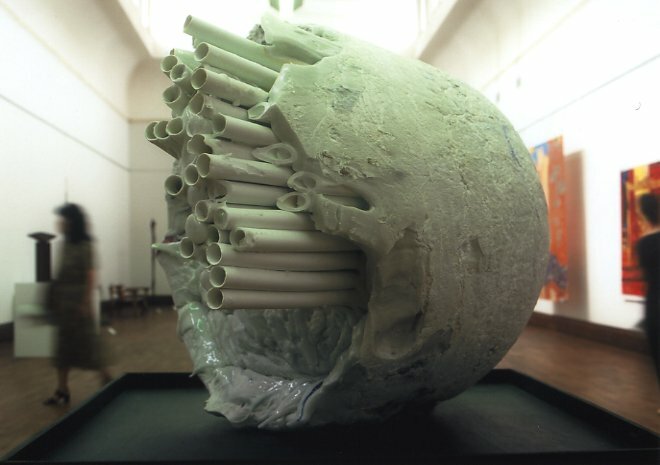 The porcelain pipes, like the skeleton of one's body, comprise but a fraction of the total body weight of the piece. 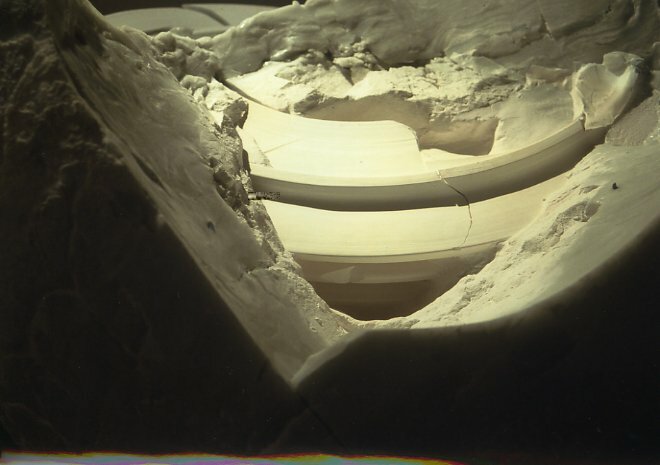 The milky, white feldspar seems to melt like marshmallow between the bones, at places crisp, at others, moist. Faint colors spring from the glaze, in varying shades of blues, greens, and reds. With staring, one enters a dream, and a simple, pristine thought unravels: where does glaze end, and ceramics begin? The question is a philosophic one. What necessarily constitutes pottery, and what differentiates ceramics from a glob of glaze? Nishida (1977- ) is exciting in his pursuit of burying functional ceramic objects -jars, pipes, plates, in the icy entrapment of glaze. It is almost as if he is proposing a solemn funeral to the utilitarian vessels (and the traditional conceptions of pottery) that we have grown accustomed to seeing and using. Is Nishida waving an unremorseful farewell to what pottery stands for, and to the reasons why pottery first came into existence? Buried deep within his ceramics, Nishida has reversed the concept of glaze into the superior and not the submissive, which was its traditional function. This is, in many ways, a landmark event in the history of pottery. In the 21st century, technology has advanced to a level where it is hardly implausible to contemplate a future where robots born and bred with artificial intelligence may take precedence over those who spawned them (in other words, mankind). A rough analogy to be sure, but we must understand that the magnitude of Nishida's pottery asks us to re-examine what clay actually stands for, and to observe that the master might someday shine the shoes of his disciple. The perplexing question is found in all great works of conceptual/avant-garde Japanese pottery in the 20th century. Tomimoto Kenkichi (in many ways, the first conceptual potter in Japan), Yagi Kazuo, or Koie Ryoji, are vivid examples. But this question, or the idea that Nishida wishes to express, is hardly the only one. The young potter, who looks more youthful than his age belies, with dyed brown hair, a slight goatee, and the built frame of a wrestler, was originally preoccupied with physically expressing a broad range of temperatures (and their effects) in a single piece of pottery. In a cafe near his university, Nishida points to his coffee cup, still filled with coffee that grew colder as he explained his thoughts, ever so slowly. "Even in this porcelain cup, no matter how small or how thin, is an example of 'temperature range.' The facade might be, say 1240 degrees Celsius, but the inner side might only reach 1200. I thought it would be interesting to see if this could be made into a form of expression. We think we see the same thing happening, but chemically, this might not be the case." Glaze is the best way to track variance in temperature within a single kiln. But glazing a piece of porcelain or stoneware in a traditional fashion would only produce one to two-dimensional changes. Nishida desired to get at the core of what was happening, and that meant actually digging into the depths of glaze in order to find vivid expressions of temperature range. This wish was the spark that led to Nishida's mountains of glaze. Nishida pulls up the sleeve to his left arm, and sheepishly exhibits the wounds that had been inflicted on his body during the process of excavating his work. Like an archeologist digging into the earth of Crete to find Hellenistic artifacts from days long passed, Nishida digs to find an inner beauty that lies hidden within his feldspar. His eyes still on his wounds, Nishida remarks that, "it really isn't pleasant, the thought of pulling my work from the kiln. I'm terribly frightened of the mess I've made." I've met many potters who exclaim that the opening of one's kiln is akin to bliss, reassurance, and salvation. Yet it appears that to Nishida, he loathes the thought of having to confront his work. 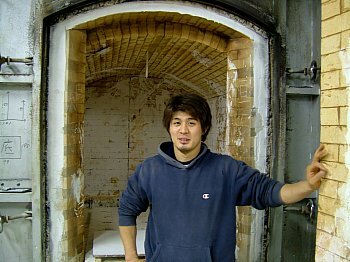 "Sometimes I open the kiln door, look in, try to comprehend what happened, then say 'oh my,' and immediately slam the door shut," Nishida chuckles. This is a subtle form of denial that he likes to play with, but it is duly understandable when we observe the many scars that dot his arm. 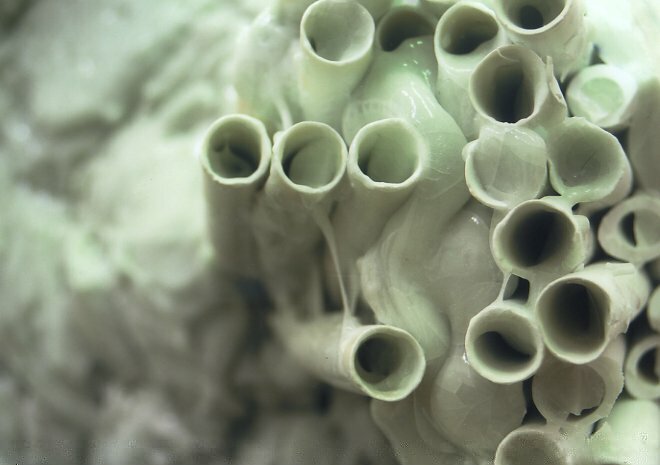 Nishida's ceramic art is, quite literally, a gigantean affair. Weighing more than 1,000 kilos, and measuring approximately 1.5 meters tall, Nishida makes works that are difficult to transport, let alone remove from a kiln. Brute physical strength is needed. 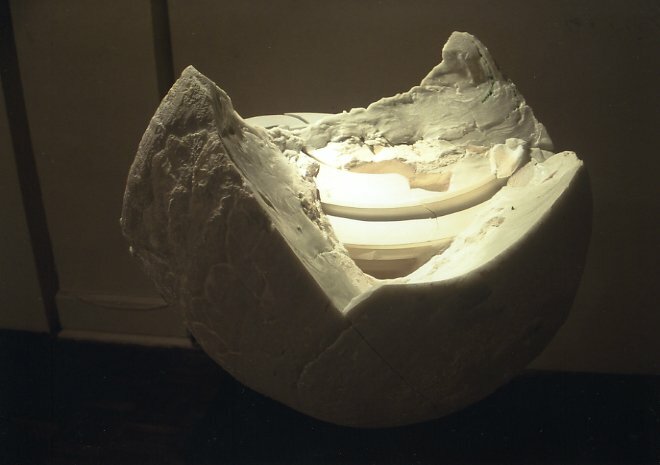 Nishida has used a crane to "salvage" his work, and had to break the kiln door (and the kiln walls) in order to remove his creation, which had expanded during firing. In other words, Nishida's muscular physique, a remnant of his rugby days, is needed to bust open a kiln, or to shovel his way from the mess of feldspar that had leaked this way and that, almost swallowing the inside of his kiln as if some symbiotic monster. 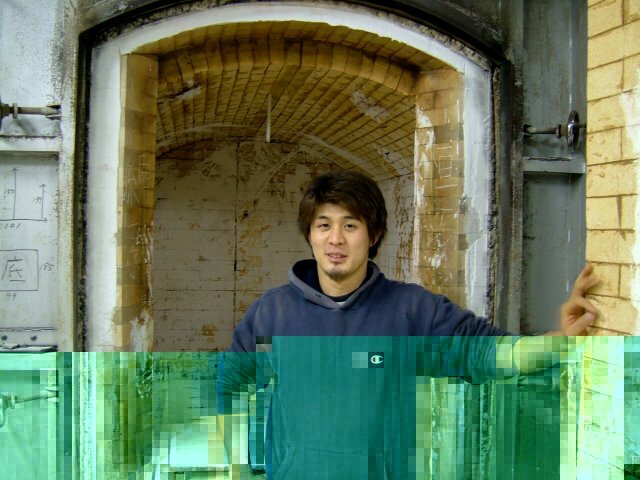 Nishida is testing the limits of his kiln, and is testing the limits of his own physical strength. "After removing comes excavating, which is, quite probably, the most fun I get out of the entire process." The heap of glaze and ceramic is hardly finished, even after its emancipation from the mouth of the kiln. In other words, Nishida's creation is only completed post-firing. With a chisel, hammer, shovel, and any other tool at his disposal, the artist cracks open the egg-like mass before him. And with each chisel, sharp chips of glaze dart through the air, cutting and scratching any bit of skin he failed to cover. Goggles are essential. "My works are examples of nature, and are essentially copies of natural forms. It's similar to how Mother Earth makes stones." In other words, Nishida isn't trying to limn the trees and oceans and the sky in his works as a form of symbolism. Rather, he tries to limn the ever natural "fact" that nature is present in clay and in glaze, and that nature is, quite naturally, the mother of all creation. Nishida digs through his work to help facilitate, evidence, and unleash what had occurred inside. And by aesthetic whim, he leaves some parts intact, while others are split and halved, others dug and thrown away. Such is Nishida's creative process. A major aspect of contemporary craft is its pursuit of extremity, both poetically and physically. 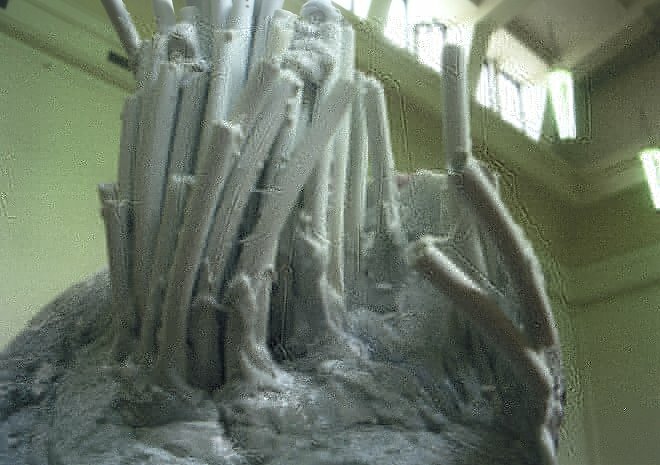 We are at an age where traditional techniques have been mastered, both through practice and through technology, to levels that could not be realized before; and we see, in various aspects of craft, artists testing the limits of their art. For example, lacquerware artist Suzuki Mutsumi has revolutionized the way lacquer is made. The wood used in his pieces are barely 0.3 millimeters thick. By meticulously brushing layer after layer of lacquer onto an absurdly thin piece of wood (more akin to paper), Suzuki creates a lacquered vessel that is both extremely light and a pleasure to touch and feel. "I really can't explain things very well," Nishida says humbly, "as I'm not too bright." 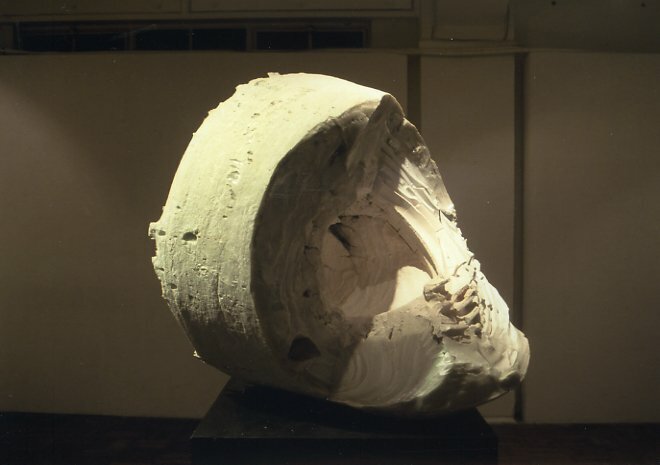 Young Nishida is extremely self-depreciative and modest even after he received the Grand prix at both the International Ceramic Festival in Mino (2002), along with the Faenza International Ceramic Exhibition (2003, Italy). Not bright? He's absolutely brilliant. The art mafia in Japan is quickly tuning into his talents, and rightly so. His talents, and his vision, are extraordinary. His conceptual pieces, due to their large size, are a tad difficult to purchase for the everyday collector. Luckily for us pottery fans, conceptual/abstract pottery is not his only method of work. Nishida actually enjoys creating functional vessels, and predicts that he will make much more, such as guinomi (sake cups) and chawan (teabowls) in the not-so-distant future. Nishida is currently in Indonesia as I write, working on preserving the pottery traditions of rural island villages in and around Java and Bali. It is his life-mission, and it is a noble one. In particular, the islands of Java and Bali have a unique tradition of pottery thrown with a slanted wheel. Such a wheel is not found elsewhere in the world, yet unfortunately, the technique is quickly disappearing, as potters (usually female) are turning to work more profitable than pottery. Nishida is building, by hand, several large communal gas kilns that could be shared by entire villages. "It is, in many ways, a double-edged sword. After we give them the tools, they will learn industry, and more and more of their youth would not have to leave their villages in order to make a living. However, along with industry, they might abandon the tradition we intended to preserve -the slanted wheel. It is a difficult process, but I think we have to start somewhere. Building a kiln is only the beginning. It is a beautiful tradition. I hope to keep it from fading." Born 1977. Graduates from Kyoto Seika University in 2000, graduates from Kyoto Seika University Graduate School in Ceramics in 2002. Currently assistant advisor to Kyoto Seika University's ceramics department, as well as lecturer at Ikenobo College. With great regret and reluctance, JCN updates will be placed on temporary hold for the time being. As much as I'd like to continue writing on a weekly basis, many unforeseen and inevitable circumstances have made it considerably difficult to proceed. I'm hoping to write when I can, and ideally on a monthly basis. There are a myriad number of things I've yet to mention, and that I believe need to be written about. I only wish I could do so more freely. However, I ask for your understanding that this project is, more than anything else, a labor of love, and a subtle wish to spread the word on Japanese ceramics to a wider audience. Although the frequency of this column may change, please remember that the spirit with which it is written will never falter.